There is something about Ball jars that I love. I would happily store all our foodstuffs in them just because I find them lovely. I will look for any occasion to use one and am definitely the girl at work who drinks her water during staff meeting from a Ball jar. There is no shortage of moonshine jokes when I do this. 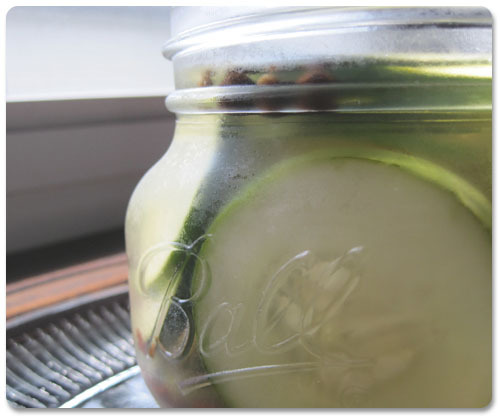 I recently found a refrigerator pickle recipe from the Chicago Tribune via Man Made DIY. Even though I’m not traditionally a pickle person I needed to give it a try. Why? Because I had a Ball jar that I could use. Thanks to my Ball jar obsession, I’ve realized how delicious homemade pickles can be. I used the recipe as posted, but added one teaspoon of sugar to the brine. These pickles are about the freshest things ever. They’ve still got a nice, crisp cucumber appeal, but have a delightful salty tang. I’m glad I gave them a try, but with two small jars that needed to be consumed in about 10 days I had to find ways to use them that didn’t involve eating them straight from the jar. They tasted amazing on our backyard burgers, but eating one or two pickles at a time wasn’t going to make them disappear. In my quest to not waste food, I decided we needed a better solution — a mass pickle-using solution. 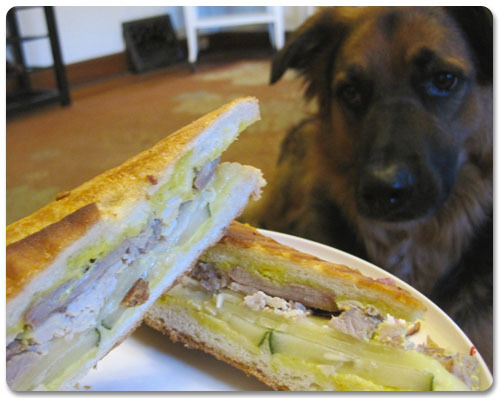 A Cuban Sandwich solution. While they are about the least attractive sandwiches to photograph, they might be the tastiest. Cuban Sandwiches will make your day. They might even make your dog’s day. YUM! I LOVE PICKLES and Cuban sandwiches! Mmm..starving now.